Injury risk during running is associated with high-weekly training distance as well as lack of running experience, putting both competitive long-distance runners and novice runners at risk of developing overuse injuries. The development of overuse injuries has been associated with kinematic variables of all lower limb joints. Some of these variables, such as increased ankle pronation, increased knee internal rotation, as well as increased rearfoot eversion have been reported to occur with the development of fatigue over the course of a run. The risk of developing overuse injuries may be magnified during running in a fatigued state. Changes in running kinematics with fatigue may be more prominent in novice runners, since they lack the training status and technical skills to maintain their non-fatigued kinematics towards the end of an exhaustive run. Most studies on kinematic changes with running fatigue focused on recreational runners or runners with a particular overuse injury, while studies including well trained, competitive runners are less common. Competitive long-distance runners may be more resistant to changes with fatigue compared with novice runners due to their better training status. The purpose of this study was to identify changes in the peak joint angles during stance as well as the kinematic waveforms of a whole stride cycle after an exhaustive run in novice as well as competitive long-distance runners. 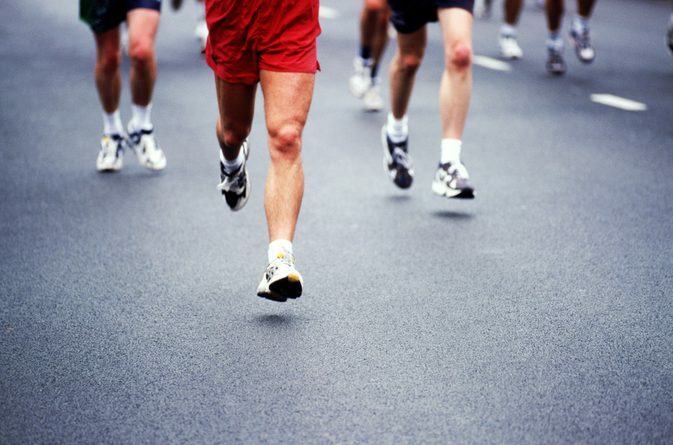 The second aim was to determine whether novice runners and competitive runners respond differently to an exhaustive run. 15 novice runners and 15 competitive long-distance runners volunteered to participate in the study. Novice runners (NOVICE) were included if their weekly running distance was less than 10 km/week and if they did not have a history of competitive running, or following a running training programme. Yet, they had to be able to finish a 3,200 m time trial without pausing or walking. The COMP group (5 females, 10 males) and the NOVICE group (6 females, 9 males) were similar in age, height, and weight. COMP runners ran on average 77 ± 17 km/week and had been running for 10 ± 3 years. Average speed was 2.75 ± 0.50 m/s for the NOVICE runners and 4.88 ± 0.57 m/s for the COMP runners. Mean time to exhaustion was 1,693 ± 588 s for the NOVICE runners and 947 ± 284 s for the COMP runners. A three-dimensional kinematic running analysis was performed using a 10 camera motion capture system capturing at 150 Hz. Forty-two reflective markers were placed on anatomical landmarks on the trunk and lower limb of the participants. Two 10-s trials were recorded both at the beginning and the end of the exhaustive run. During the dynamic measurements, participants ran on a force-instrumented treadmill, sampling at 1,000 Hz. Vertical ground reaction forces from the force plate in the treadmill were used to detect foot strike and toe-off. Analysis of the peak joint angles during stance phase indicated that there are differences in kinematics between running in a exhausted vs. a fresh state in both groups. In the NOVICE group, increases in peak trunk flexion (3.0°, p < 0.05), trunk rotation ROM (3.5°, p < 0.05), peak pelvic anterior tilt (2.0°, p < 0.05), pelvic rotation ROM (2.4°, p < 0.05), peak hip flexion (0.9°, p < 0.05), peak knee extension (1.8°, p < 0.05), and a decrease in peak ankle abduction (3.6°, p < 0.05) were found. In the COMP group, an increase in pelvic anterior tilt (0.9°, p < 0.01), pelvic obliquity ROM (1.6°, p < 0.05) and pelvic rotation ROM (2.3°, p < 0.01), a decrease in peak hip adduction (1.3°, p < 0.01), an increase in peak knee abduction (2.3°, p < 0.01) and a decrease in ankle plantar flexion (3.1°, p < 0.05) were found. To determine whether novice runners respond differently to exhaustion compared with competitive long distance runners, interaction effects for group × exhaustion were calculated. A group x exhaustion interaction effect (p < 0.05) was found for peak trunk flexion. In the NOVICE group, trunk flexion increased with 3.0 ± 4.2° with exhaustion, which was significantly more than in the COMP group, in which trunk flexion increased with only 0.2 ± 1.9°. Statistical parametric mapping (SPM) analysis showed an interaction effect between group and exhaustion for the hip abduction/adduction early in the swing phase: NOVICE runners changed towards more hip abduction, whereas COMP runners changed towards more adduction. In conclusion, runners showed changes with exhaustion at the trunk, pelvis, hip and knee level. These changes were more pronounced in novice runners compared with competitive, long-distance runners. This may be caused by more muscular fatigue in the trunk, hip and thigh muscles in untrained runners. Source: Maas E et al. (2017) Novice runners show greater changes in kinematics with fatigue compared with competitive runners. Sports Biomechanics.